Almost all commercial brewers filter their beer to rapidly improve flavor and clarity. Yet few home brewers filter their beer, either because they lack the equipment or prefer the raw flavor of unfiltered beer. However filtering is a good option for intermediate to advanced brewers who want crystal clear, smooth flavored beer. Filtering removes yeast, tannins and some large proteins from the beer that contribute both to off flavors and haze. While many of these impurities will eventually precipitate out of the beer through lagering and aging, filtering accelerates the process by removing them in minutes instead of weeks or months. This is a big reason why commercial brewers use filters – time is money and it is much cheaper for them to filter the beer than store it for weeks or months. Filtering also has the advantage that it can remove very small impurities from the beer – even those that would not fall out of suspension in the natural aging process. Filters can remove particles as small as 1 micron or even smaller. This can result in a cleaner flavor and much better clarity than is possible with natural aging. A question many new brewers ask is if they can filter their beer to eliminate the sediment in the bottom of the bottles? The answer is unfortunately no, unless you have some kind of kegging/carbonation system. Filtering the beer removes the yeast from it, so if you filter and then bottle with priming sugar you will just get flat beer. The only way to filter and bottle beer is to filter your beer into a keg, then artificially carbonate it, and then bottle it from the keg using a counter-pressure bottle filler or beer gun. Also having a pressurized keg makes it much easier to use an inline filter, as gravity works very slowly with typical beer filters. First, you need to choose a filter size. The filter should be fine enough to filter out tannins and yeast cells, but not too fine or it could alter the flavor of your finished beer. Around 1 micron is the sweet spot for filter size – smaller than 0.5 microns and you risk filtering out some flavor, while larger ones (5 micron and up) may leave yeast in the beer. To filter out bacteria which some commercial brewers do for shelf stability, you need to go to 0.3 microns or below. I don’t recommend going below 0.5 microns for home brewing. Another factor when choosing filter size is how fast your filter may clog. Many commercial brewers actually use a two stage filter. They start with a 5 micron filter to eliminate the large particles and then use a smaller 0.5 micron filter inline as a second stage to filter small particles. If you have a large budget you can do the same, but for a single filter 1 micron is fine. 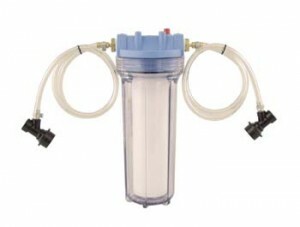 The most popular beer filters are inline canister filters with a replaceable filter element. These are inexpensive and work well if you have high quality filter cartridges. Some wine filters come in a plate format which offers a larger surface area that is less prone to clogging. I do not recommend using household water filters as these are slow and prone to clogging. Purchase a filter designed for use with beer and change your filter often as the small inline filters clog quickly. Despite the fact that filtering can be used to accelerate the aging of your beer, you don’t want to filter your home brewed beer too early. Some important chemical changes take place during the later phases of fermentation and early aging. If you halt these too early by filtering you will end up with poor flavor balance. Commercial brewers use a additives and techniques that allow them to filter earlier. Allow the beer to fully complete fermentation and then sit in the secondary for at least 2-3 weeks before filtering, then move it to your keg. The filtering process is very simple if you use two kegs. Place your inline filter in between the full and empty kegs and use low CO2 pressure to transfer the beer from one keg to the other through the filter. Once the filtering/transfer is complete, close the top on the second keg, purge the air from the top several times and you can refrigerate and force carbonate it as you normally would with any keg. Filtering home brewed beers is not always required or even desired, but when you want that extra bit of clarity and clean finish it is a nice alternative. Do you have thoughts or experience with filtering? Leave a comment below. Thank you for joining us on the BeerSmith Home Brewing Blog. Subscribe for more articles as well as the latest news on my upcoming brewing book and other BeerSmith products.